Count Spectacular Video Slot Guide & Review - Casino Answers! Count Spectacular is a 5-reel, 25-line video slot developed by Realtime Gaming, featuring expanding wilds, scatter wins, multipliers, a re-spin feature, a free spins feature and two progressive jackpots. You can play the Count Spectacular Real-Series Video Slot at Bovada. Bets on the Count Spectacular slot machine are $0.01, $0.02, $0.03, $0.04, $0.05, $0.06, $0.07, $0.08, $0.09, $0.10, $0.25, $0.50, $1, $2.50 and $5 per line. You can select up to 25 paylines on the Count Spectacular slot game. You can bet anywhere from a penny per spin up to the maximum total bet of $125. Count Spectacular has a good betting range that is suitable for both casual players and high rollers. You can manually skill stop the reels on Count Spectacular by pressing the “Stop” button in the middle of any spin you make. To spin the reels on the Count Spectacular video slot, select your bet and press the “Spin” button. The top paying symbol on the Count Spectacular online slot game is the Count Spectacular symbol. If you can line up 5 Count Spectacular symbols on a selected payline, you will win the 10,000 coin top fixed jackpot. The Count Spectacular symbol is an expanding wild symbol and will substitute for all symbols including the Scattered Castle symbol. When it appears in a winning combination, it will also expand to cover the entire reel. The Count Spectacular symbol counts once per reel for scatter symbols. 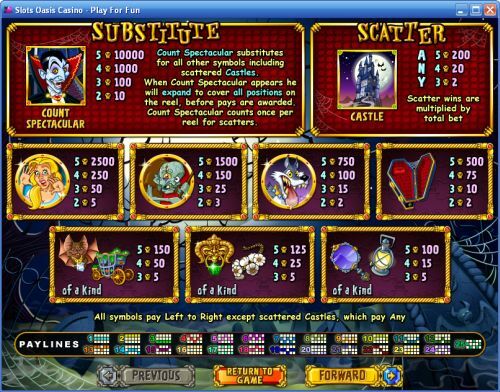 Other high paying symbols on the Count Spectacular slot game are the Victim (2500 coins) and Hunchback (1500 coins) symbols. Count Spectacular’s scatter symbol is the Castle symbol. 3, 4 or 5 Scattered Castle symbols will pay out 2X, 20X or 200X your total bet. When the Count Spectacular symbol lands on reels 1 and 5 at the same time, you will trigger the Count Spectacular feature and be given the choice to either play 12 free spins with a 3X multiplier or 4 re-spins. If the re-spins are chosen, reels 1 and 5 are held while the remaining reels are re-spun 4 times. The Count Spectacular feature cannot be re-triggered during the re-spins feature. Both the free spins and re-spins features are played at the lines and bet of the triggering game. You can win big from either one of these features when you play Count Spectacular at Bovada! The Count Spectacular video slot features two progressive jackpots – the Minor Jackpot and Major Jackpot. The jackpots are currently at $315 and $1,461 respectively. Both of these jackpots are triggered at random and can be won on any spin you make on the Count Spectacular slot game. Progressive Jackpot wins are added to other wins. Random Jackpot contribution is no more than 1.5% of the total Return to Player. Hit the “Autoplay” button to open the autoplay settings. You will be able to set the number of spins, set it to stop when the jackpot is won, stop if a win exceeds or equals (any amount you input), stop on any win, stop if your balance increases/decreases by any amount you input and stop once the feature is triggered. You can stop Count Spectacular’s autoplay mode using the “Stop Auto” button to deactivate it. The Count Spectacular video slot looks excellent, especially the animated Count Spectacular symbol. Not only does it have two progressive jackpots that can be won at any time, but also the top fixed payout is excellent. The main feature in the game is also great because it gives you a choice between free spins or re-spins. The expanding wild helps out a lot because not only does it expand at all times, but it also substitutes for scatter symbols. The only thing really missing on the Count Spectacular slot is a bonus game. You can play the Count Spectacular video slot when you sign up and make a deposit at Bovada. If I’m based in the USA, can I play Count Spectacular slot game for real money? 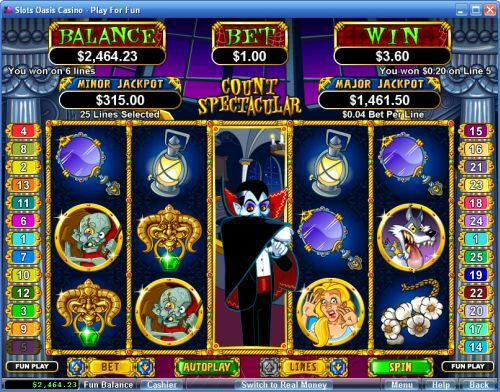 Yes, you can play the Count Spectacular video slot at many RTG online casinos, including two of the best, Bovada. How do I win the progressive jackpots on the Count Spectacular online slot? To win either one of the Count Spectacular slot machine’s progressive jackpots, all you have to do is spin the reels and play. Any spin you make can win. To better your chances of winning the progressive jackpots, increase your bet per line. Where can I play more Halloween-themed video slots? To play more Halloween video slots, you can read our list of Halloween slots.